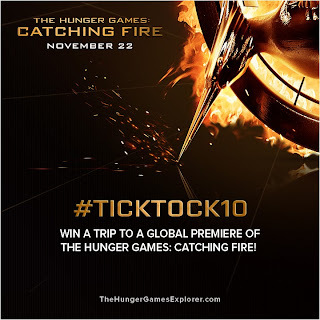 Home » » #TickTock10 Revealed: Win A Trip to a Catching Fire Global Premiere! #TickTock10 Revealed: Win A Trip to a Catching Fire Global Premiere! The HungerGamesExplorer competition involves tweeting using the hashtags: #CatchingFireLondon, #CatchingFireBerlin, #CatchingFireMadrid, #CatchingFireRome, or #CatchingFireParis. The city with the most tweets will get one winner to attend. Jennifer Lawrence, Josh Hutcherson, Liam Hemsworth and Francis Lawrence have been confirmed to attend. It appears that the competition hosted by HungerGamesExplorer is only open to US entrants (click here for full T&Cs), but the individual countries' pages will be holding their own individual competitions! Each country will have 2 tickets each to give away to one lucky winner! See the list above for links to all the individual contests.